Negotiators from sixteen Asian countries meet in Bangkok, Thailand this week to try to finalize a massive trade deal, the Regional Comprehensive Economic Partnership (RCEP). If completed it could have devastating consequences for standards in agriculture, services and manufacturing, and the lives of billions of people, yet the negotiations are happening behind a veil of almost total secrecy. Trade experts from across Asia assessed the RCEP negotiations against criteria for transparency, public participation and good governance and found great cause for concern. The negotiations do not meet international standards for transparency or public engagement, but big businesses have been allowed ample access. There is negligible official public information about the state of negotiations, no publicly-available draft texts or adequate details of key government positions. It is not possible to access any details about the RCEP deal except through leaks. Everyone, from elected parliamentarians concerned about potential job losses in their regions to journalists investigating potential impacts on the affordability of life-saving medicines, to citizens concerned about food quality or the types of energy they consume are all kept in the dark. 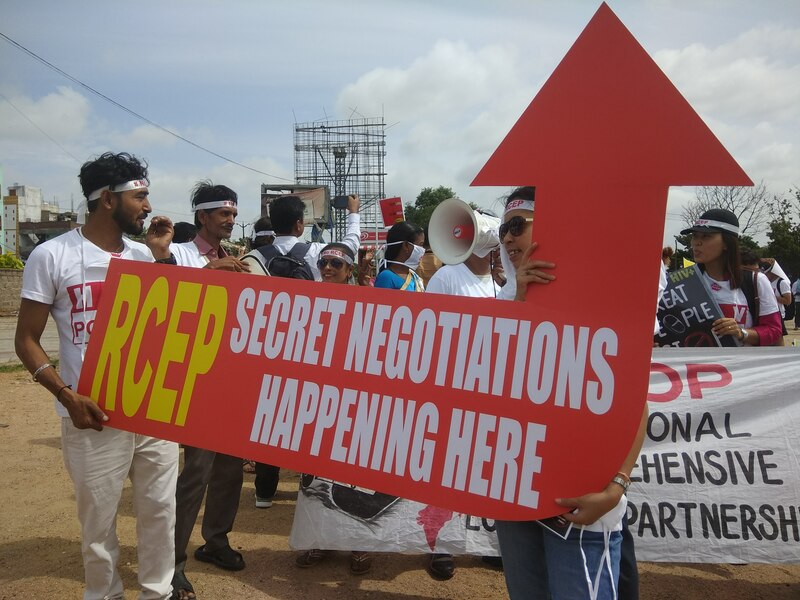 Countries in the RCEP bloc argue that the strategic diplomacy around this process makes secrecy inevitable, but many international negotiations provide a far greater degree of transparency. The United Nations climate negotiations, The World Health Organization’s negotiations on tobacco control and the World Intellectual Property Organization all make submissions from negotiating parties publicly available, with regular meetings open to the public or stakeholders. Even the World Trade Organization publishes most negotiating texts, and reports by committee chairs are available on their websites. Claiming secrecy is inevitable in international negotiations such as the RCEP is simply a political smokescreen. Transparency and public participation are key principles of government decision making. In order to make good decisions, people need to know what is being discussed. The secrecy in RCEP contravenes the Association of Southeast Asian Nations (ASEAN) charter, which promises to adhere “to principles of democracy, the rule of law and good governance”, and undermines international legal principles of free, prior, informed consent (FPIC) and principles of participation deriving from the International Court of Justice statute. Even parliaments are often shut out from a meaningful role in the negotiations. In Australia for example, decisions about negotiating, signing or becoming party to RCEP or other trade deals are taken by the executive without approval or debate in Parliament, which gets only a yes or no vote to pass legislation resulting from the treaty. Similarly disturbing processes were found in the majority of RCEP countries. In India, the regional government of Kerala has opposed the RCEP, arguing that the central government’s unilateral commitments will undermine and violate the federal and cooperative structure of the Indian constitution. Several sensitive negotiating items in RCEP such as agriculture and health fall under the regulatory mandate of regional governments. Without public and parliamentary oversight, the deal could be vulnerable to corruption. The RCEP negotiating process is far from democratic, with public participation minimal to nonexistent. But big business lobby groups have a privileged, semi-official role. During the 20th round of RCEP negotiations in India, civil society organizations had just three minutes each to speak. Meanwhile, the Ministry of Commerce held a full day’s consultation with the Confederation of Indian Industry and East Asian Business Council. The event provided “a unique opportunity for RCEP negotiators to hear directly from businesses what are the potential rewards that could be derived from the outcomes negotiated”. Reportedly, a Ministry of Commerce official commented after the meeting that “the Ministry would prepare an initial offer on goods” for RCEP. Corporate capture means outcomes are heavily tilted toward big business at the expense of the environment, health and safety standards. The Investor State Dispute Settlement provision included in RCEP and many other trade deals institutionalizes secret privileges for business. The mechanism enables corporations to sue governments in "private tribunals" when policies frustrate their expected profits. Corporations have claimed over US$31 billion dollars from RCEP countries for public policies including stopping mining, increasing taxes or removing subsidies. Corporate influence can be seen in proposals made by Korea and Japan about intellectual property (IP) provisions in RCEP, which would be seriously detrimental to access to medicines, public health and food sovereignty. Proposed provisions mirror Big Pharma’s demands for RCEP to provide “robust patent and intellectual property protection as well as enforcement”. Big Pharma’s role in trade talks is huge. Japan’s most influential big business group, Keidanren, is chaired by Sadayuki Sakakibara, golfing buddy of the Prime Minister. Sakakibara sits alongside the PM and other ministers on the Cabinet’s Council on Economic and Fiscal Policy, and was appointed to the pro-corporate trade Industrial Competitiveness Council. Sakakibara is Senior Advisor at Toray Industries, a Japanese chemical multinational with interests in pharmaceuticals. It doesn’t have to be like this. Public opposition to secretive free trade deals is growing. Parliamentarians and the public should have full access to the contents of the negotiations. Trade deals affect our environment and rights. They cannot be conducted in the dark. Sam is a campaigner for economic justice at Friends of the Earth. Benny is a researcher with the Transnational Institute (TNI) working on trade policy, corporate power and new politics.